I backtracked to one of my older TBR lists and pulled this one out of the files. Having one-clicked it over a year ago (and having just come off the magnificence that was “The Martian”), I was in the mood for more of that insurmountable “end-of-the-world/starting over” feel. Jeevan was crushed by a sudden certainty that this was it, that this illness Hua was describing was going to be the divide between a before and an after, a line drawn through his life. Much love from my fellow readers, along with a ton of awesome reviews, and my realization that I LOVE survival stories… I couldn’t wait to devour this one! Anna: I’m 2/3 through Station Eleven right now and am loving it! The writing is brilliant and the whole story is completely captivating. Highly recommend! 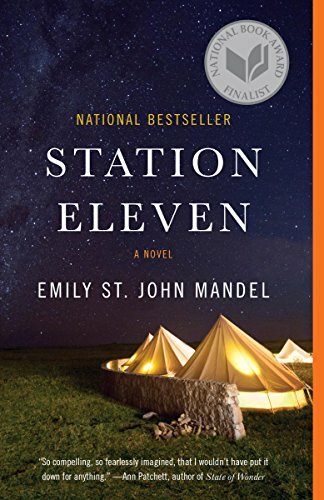 Michelle: Station Eleven was awesome… I’ve never read anything like it. I do not even know how to describe it: haunting and elegant come to mind though… Read Station Eleven. It’s a breath of fresh air. …Station Eleven was a 5 star. MichelleS: Station Eleven is really really good. I keep talking to my son and husband about it. I may turn in to one of those “preppers” by the end of this book. I feel the need to stock up on Aspirin and Antibiotics and canned goods! … I am totally caught up in these fascinating characters and the world “after” the event. And of course, she quotes Star Trek, “Survival is insufficient”, so I am seriously geeking out! MichelleS: I haven’t bookmarked this many pages in a book in as long as I can remember. I think my husband is sick of hearing me read aloud. It is an amazing piece of work. Not one wasted word. What an interesting way to tell the story, through these oddball, interconnected people. Thank you, Michelle, for this amazing recommendation. Now… out to prep for the apocalypse, because this book got me all worked up! Fabi: I’m still really early on Station Eleven. I’m finding it a bit creepy this early. Also, *cue the rotten tomatoes* I really don’t like Shakespeare. All the references and quotes make me feel like I’m slogging through swamp water. Shakespeare and I have never gotten along. I’m just trying to read past this early part to get to the apocalyptic story I know is in there. MichelleS: I’m feeling very melancholy. I was so invested in Station Eleven, I started feeling like it was happening to me. What would I miss if our world, as we know it, ended because of a pandemic? There were no zombies. Nothing scary. Just a deep, deep melancholy about all of it. I think I’d miss my Kindle, for sure. And dental care. And all that food you guys keep talking about, because I hate venison, and people always get stuck eating Bambi in the dystopian novels! What? Are cows too fast to catch in the pastures? Did the flu kill them too? And air travel…. I’d never get to see Scotland, Laura! My cousin lived in Glasgow and loved it so much, she stayed. She’s now in England, but was in your beautiful country for years. Yea. That’s what I’d miss. Not your square sausage (even though it probably fits better on the bread). Jean: Bev, I’ve been wanting to read Station Eleven for so long… bought it a long time ago! Maryse: Me too… Station Eleven. GAH I keep forgetting that one and I KNOW I’ll love it. It’s right up my alley. bev: Finished Station Eleven. Loved it. Pretty much almost right there with you guys. but as good as it was, I found myself putting it down OFTEN. Highlighting the lives of multiple characters (before and after) that were interestingly interconnected, although not necessarily familiar with each other, it was an interesting look into each story (whether it started off with their present, and backtrackint to their past, or for others, started us in their lives before the epidemic, and came back later, with their current struggles). But it was long (or maybe just long-winded, for me). Throughout the whole book, I would go back and forth with my interest and intensity of my investment into this story. The whole… “OMG! YAY!! THIS IS GOOOOOOD!! !” and then I’d find myself back to slowish, thinking… *sigh* “I don’t want to switch through so many characters. I don’t want to switch back in forth so much!” I want to continue the intensity! It was interesting, and at times, even riveting, but also, (for me) often… monotonous. And yet, I couldn’t stop reading it because I was dying to know how it would end. Where was this going? This one was never a DNF’er for me. I enjoyed it enough to experience it through its entire journey. And I LOVED that it didn’t go the zombie (or any sort of paranormal) route. This was just “life” as it could be. Famous people, successful rich people, children, and students, bartenders and grocery clerks, falling victim to an flu epidemic that wipes out most of the population. Of the entire world!! No esoteric meaning, no zombie apocalypse, not even survivors with super-human immune systems (although maybe a few had that)? Who knows? Many assumed that the reason they had not succumbed to the virus was simply because they had not been exposed (meaning they were always on alert). And I LOVED that. Because there were so many questions, so many doubts, but one thing every survivor knew, the world was no longer anything close to what it had once been, and may never be in their lifetime. Lifespans had been drastically reduced. Loneliness and fear had been drastically increased. And this one was about that. The survivors that were left over. From the start… to “right now” at twenty years later. What I loved the most? The start. I love exploring the what-ifs, and the intensity of the panic and world-ending situation. When it is first discovered. How it’s handled. And the inevitability (and then the almost… hopeless… survivability) of it all. I LOVE EXPLORING THAT. And while this book did occasionally venture back to the “beginning of the end”, it didn’t stay there long enough for my own personal enjoyment. No more countries, all borders unmanned. No more fire departments, no more police. No more road maintenance or garbage pickup. No more spacecraft rising up from Cape Canaveral, from the Baikonur Cosmodrome, from Vandenburg, Plesetsk, Tanegashima, burning paths through the atmosphere into space. No more Internet. No more social media, no more scrolling through litanies of dreams and nervous hopes and photographs of lunches, cries for help and expressions of contentment and relationship-status updates with heart icons whole or broken, plans to meet up later, pleas, complaints, desires, pictures of babies dressed as bears or peppers for Halloween. No more reading and commenting on the lives of others, and in so doing, feeling slightly less alone in the room. just to be sent to the “future” and getting to know characters that had already been living this new life for decades, now. And EVEN once I finally got into that story (and it had SO MUCH potential!!!!) Oooooof the prophet. “Your friend rejected the prophet’s advances,” she whispered, close to Kirsten’s ear. “They had to leave town. Stop asking questions and tell your people to leave here as quickly as possible.” She settled back into her chair and picked up her knitting. “Thank you for stopping by,” she said, in a voice loud enough to be heard in the next room. I appreciated the journey. I get why we switched out, and then back again over and over again. It’s all re-visted and answered and comes full circle (to an extent). My favorite parts? The initial discovery. The panic. The grocery shopping trip (gah I wanted to truly live that with them). The airport (or should I say… the potential of that). The tea set. Maybe even”the prophet” (again… the potential). I appreciated the look into how the main characters were connected (although there were so many of them at some point I was mixing a few up). But I think I would have appreciated it more had we stuck with a certain few main characters and followed their storylines for me to become completely invested. But I appreciated the humanity of it all. It was poignant, it was deep, but mostly (to me), it was long. 3.5 stars <— The quality of the writing was 5 stars, sure… but my experience of it was at a 3 star level. I was hoping it would capture and excite me. And at times, it did. I was expecting to devour it in one sitting, especially since I was SO in the mood for this. But it didn’t keep me captivated. Thinking how a flu could take us out is so much more scary than zombies. I think of the Spanish flu epidemic. I did love how music and story telling remained so important. Maryse, if you are still looking for something along these lines you should try a sample of Gann. I mean it is totally different from this and the Martian. ….but also about survival in a new world. Just the sample Maryse. Just that little bit, just read this || much. Hundreds (thousands?) of people loved this book. So here I am, all by my lonesome, AGAIN. I tried and tried but couldn’t get into it. I left it in my GBL for a long time, but it is, in fact, a DNF for me. I’m READING DARK MATTER!!! 😀 Right now, in fact, Perry. I NEEDED THIS! I TOTALLY get it. I get on kicks too. This is even better for me because I get to see your review before diving in myself. TBH I can’t think of another book like The Martian. The only one that comes even close to the ballpark for me is the one that didn’t work for you. *shrug* I’ll keep my ears open. Super excited you’re going into your old archives for current reads. GANN!!! Still holding out hope for that one! What else is lurking in your OLD TBR file that we could convince you to read? I really felt in the minority when I read this as I just was not into Station Eleven. I actually started reading this book while I was on a plane-lol. I thought I’d like it, but was bored with several of the story lines. I kept getting bogged down with some of the survival details- like if less than 1% of the population survives are you really not able to find a pair of shoes. Seems like there would be plenty of shoes in abandoned homes. What happen to all the shoes??? Seriously, it was just not the book for me.